It looked innocuous and many did not even know what it meant. After 26 miles of gruelling competition, Ethiopian Feyisa Lilesa approached the Sambadrome, Rio’s carnival venue and the Olympic marathon finishing line, in second place. Then he raised his arms and crossed them. 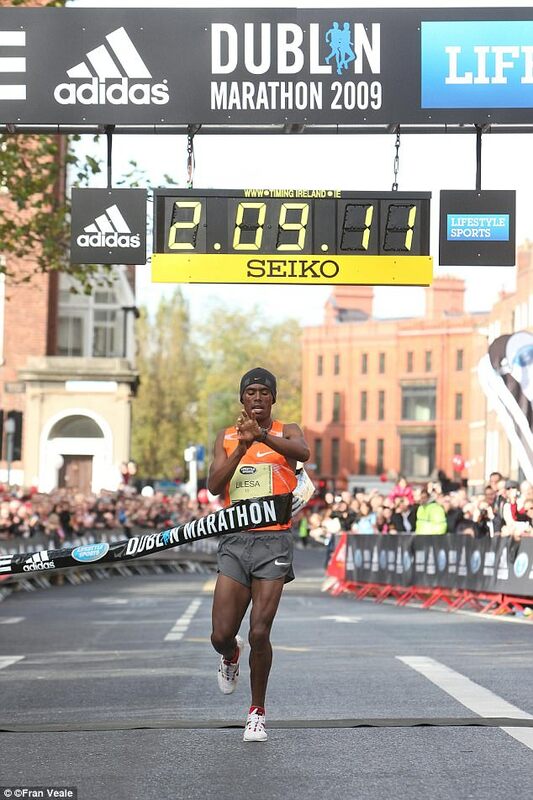 And then again, repeating the gesture all the way over the last 100 metres to the finish line. With an Olympic silver medal secured, celebration might have been expected. But as they watched 6,000 miles away back home, his wife and family were fearing the consequences of that simple act. Unknown to them, Lilesa, 27, one of the favourites for next Sunday’s London Marathon, had been running with a goal which surpassed the individual glory of winning an Olympic medal. He had told nobody of his plan, not even his wife and family. The crossed arms were a signal of protest about the persecution of his people, the Oromo, in Ethiopia, a country riven by political violence and dispute, where Amnesty International reports at least 800 protesters have been killed. Amnesty has urged the Ethiopian government to end mass arrests and beatings, as well as the unlawful detention of journalists and politicians making the Oromo cause. That made his first phone call to his wife, Iftu Mulisa, and children, daughter Soko, five, and son Sora, three, a traumatic affair. While many Oromo people were jubilant their cause was being publicised, his wife was aghast. There was no question in his mind of returning to Ethiopia. However, his family were stuck there. ‘When I first called her I just didn’t have the words to tell her and I didn’t have the words to say to her,’ he says. ‘It was a challenge initially just talking to her and explaining my decision and why I didn’t consult with them. ‘But she understood the importance of this. The problem in the country has reached every household. They understand the importance and what it means. Their two main differences were that I did not consult with them when I was planning this and not having a concrete plan for them or the future and what might happen to them. ‘This gesture was started by university students and people knew about it. A lot of people were arrested essentially for showing that gesture. Coincidentally, that same day, the government stopped a rally in Addis Ababa. People went home because the city was engulfed by military forces and they happened to be watching TV. ‘The race was being broadcast on state television when it happened, the first time I showed the gesture. But since I kept repeating it, they quickly cut the live transmission and went back to the studio. People understood why the transmission was cut abruptly. ‘Of course my family was scared and they were shocked because they didn’t know what would happen to me. I had fears for my family. But a lot of people were getting killed. I knew it was just a matter of time before it reached my family. It has touched almost every household. ‘In fact, my brother-in-law was one of the people arrested and taken away from university and he remains in jail to this day. Young people were being killed, elderly were being killed. My friends were in jail and I had other friends who were being killed. So my family also feared the same fate. I feared they would be affected one day and that they had not was just that it was not their turn. He was briefly in no man’s land in Rio de Janiero. Though he says many team-mates and officials supported his protest, he was persona non grata. ‘They don’t even want to see my face, so I don’t expect them to allow me to run for the country,’ he says. Fears for his family and career have now been addressed. 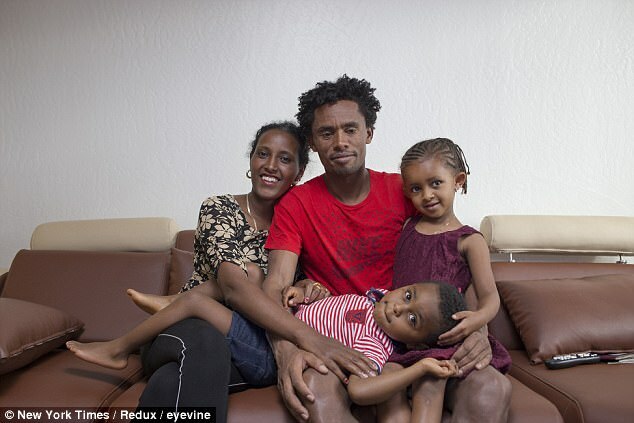 Ethiopian exiles arranged a flight from Brazil to the US and he is now based in Flagstaff, Arizona, a magnet for top-class distance runners, where he can train properly. Last month he won the New York Half Marathon in preparation for the London Marathon. 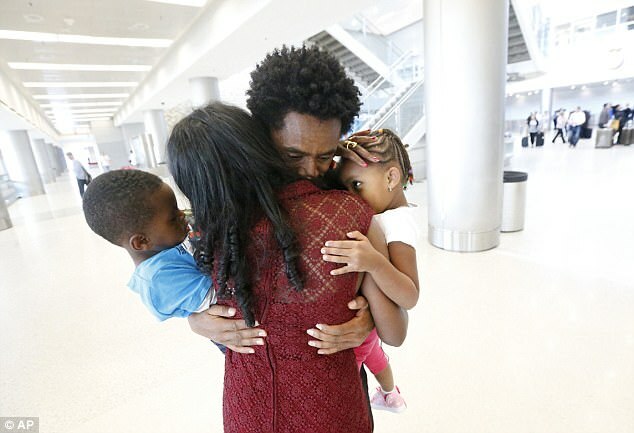 More significantly, in February his family were finally permitted to join him in the US. The reunion was understandably an emotional affair, Soko sprinting into her father’s arms when she finally saw him at the airport. ‘This was very, very important,’ he says. ‘And at least my mind is in one place in the sense that this is one weight lifted off my back. Now that at least I don’t have to worry about the safety of my children. His protests will continue. He is critical of those icons of Ethiopian athletics, Haile Gebrselassie and Kenenisa Bekele, the latter of whom he will face in London, who he says have benefited from keeping quiet and not criticising the government. A representative of Gebrselassie and Bekele responded by saying that such criticisms did not take account of the complicated and volatile political situation in Ethiopia, where they both still live. LILESA wants people, especially the British, to know more about the plight of the Oromo in Ethiopia. ‘Our people are being imprisoned, hundreds remain in jail. Others are being killed. Over the past year, people have been dropping like leaves. Others are running away to save their lives — to South Africa — and have died along the way. 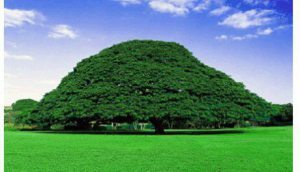 ‘The Oromo people are the majority in my country. They have a lot resources in terms of the economy. Despite that, we don’t have the political power. They have lost all their freedoms and rights. ‘I want people in England to put pressure on their government because they do provide the biggest amount of aid to the Ethiopian government, to use that leverage not to cosy up to the Ethiopian rulers but to change their behaviour and to allow our people to have their freedom and rights. Exiled Ethiopian runner Feyisa Lilesa has vowed to protest against the government at Sunday’s London Marathon, saying “blood is flowing” in his home country. Feyisa caught the world’s attention when made a protest gesture in solidarity with the Oromo people while crossing the line in the marathon race at the Rio 2016 Olympics. In an interview with the BBC’s Sport Today, the silver medalist said he did not regret making the gesture. He added that would not return to Ethiopia while the current government was in power as he would be “automatically” killed, jailed or barred from leaving the country. Feyisa refused to go back to Ethiopia after the Olympics, despite the government saying he would be welcomed as a hero. He is currently living in the US with his wife and children on a temporary visa. In Rio, Feyisa became the first Ethiopian to finish in the top two of a men’s Olympic marathon since 2000, claiming silver behind Kenya’s Eliud Kipchoge. 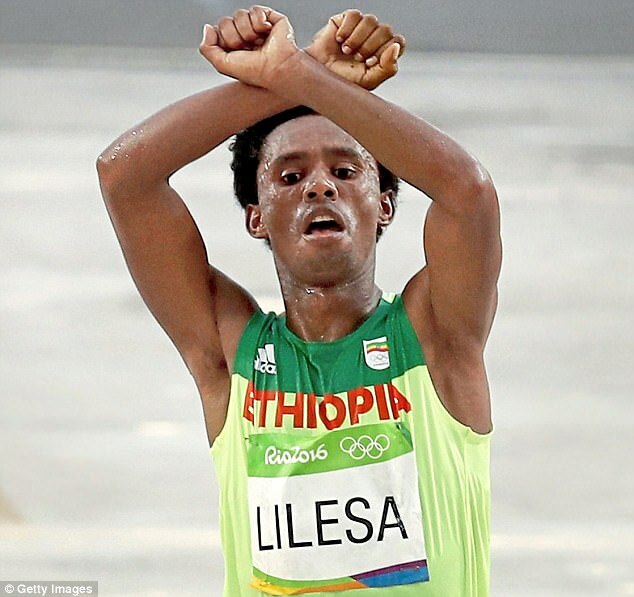 As he crossed the line, he lifted his arms to form an X above his head, the same gesture used in protests by the Oromo people, the country’s largest ethnic group, which has suffered a crackdown at the hands of the Ethiopian government. The state-backed Ethiopia Human Rights Commission said earlier this week that 669 people were killed in protests since November 2015. The government has blamed the violence on “terrorists”. A state of emergency has ben in force since last October to curb the unrest.